Clair Brothers was tasked to execute the audio design Austrailia’s Holy Spirit College audio upgrade and Videopro for the refreshment of the video system’s functionality, quality and longevity. 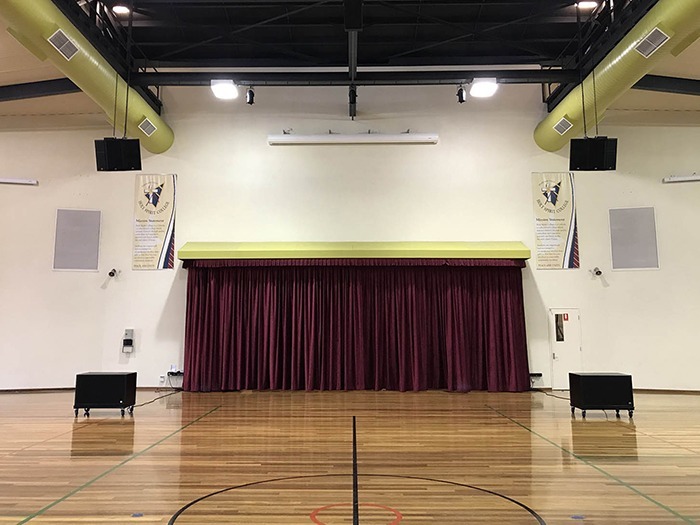 As it works with so many schools, the sports hall at Holy Spirit holds more than just sports matches. The hall hosts numerous assemblies, from college band and choir performances to special ceremonies that include ANZAC Day, college mass, fashion shows, graduations, career expos, and much more. “The new systems are part of an integrated A/V installation and the Clair Brothers equipment is the showpiece of the audio component. These loudspeakers provide a ‘wow’ factor every time they’re used. Historically, these types of rooms have limited or poorly designed audio reinforcement. This Clair Brothers system shows what can be achieved,” explained Martin Ridley of Videopro. Overseeing the installation with an expert eye on Clair Brothers role in the audio upgrade was Wayne Grosser, the director of the company’s Australian office, whose approach to this particular venue system design was based on a long-term solution that would suit the multipurpose nature of the room. The Holy Spirit College sports hall is thirty-six meters wide and nineteen meters deep. In this case, Greg recommended an array of three Clair Brothers kiT12s (60deg horizontal by 40deg vertical per cabinet) plus one CS218 subwoofer per side. “This gear and configuration provide even coverage of the large width and long throw depth. The truth is, this wasn’t really an application for a line array system. But it works incredibly well,” Greg explained.